More examples of good & bad design ... or more accurately bad-good-bad design. About a month ago I upgraded to a new MacBook Pro. There are lots of things that I like about my new laptop, but not the MagSafe 2 connector T-design shape. I was so impressed with my last laptop's MagSafe connector, and I think that was one of the reasons I stuck with it for six years. It was an elegant piece of technology through and through. 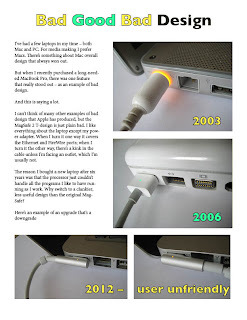 I remember thinking that one of the coolest things about it (beside the applications) was the new MagSafe technology. Although I also liked my previous laptop purchased in 2003 quite a bit, invariably someone would get tangled up in the cord and either pull the laptop along with them, or jerk it like a largemouth bass on a line. NYTimes writer David Pogue called the downgrade "one of Apple's best ideas ever – made worse."